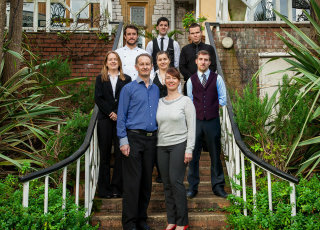 Welcome to Orestone Manor, the country house hotel by the sea. At Orestone, you will find all the things you'd expect of a small luxury hotel: comfortable and well-appointed bedrooms, fine food, luxurious public areas, and everything you need at hand. What Orestone is really about though, is the service. We are intimate enough to get to know our guests as individuals, and enjoy doing so. We can be as formal or informal as you like, as attentive or hands-off as you like. "A place where guests feel instantly relaxed, don't want to leave, and can't wait to come back"
There is always at least two members of the owning family on duty, so you can be assured you are dealing with people who care passionately about your experience, and have the experience and authority to make sure everything is done to make things just right for you. We don't have a big rule book here, preferring instead to adapt our style to each customer.Staff are well trained, then given the respect and discretion to do what is best for the customer. Our passion reverberates through the fantastic team we have assembled, and we are proud to work with each one of them. Our location on the beautiful English Riviera provides spectacular views of Lyme Bay across half a mile of open countryside. Our terrace and gardens are as nice a place as you could wish for to while away a sunny afternoon. 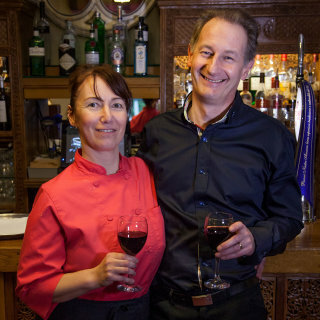 Our restaurant is popular with locals and has a warmth to it rarely found in fine dining establishments, while offering food that stands comparison with anywhere in the area. Whether you are coming on holiday for a week, or dropping by for tea and home-made scones on the terrace, you'll be equally welcome. Come and leave your troubles behind for a while, and just melt into The Orestone experience.